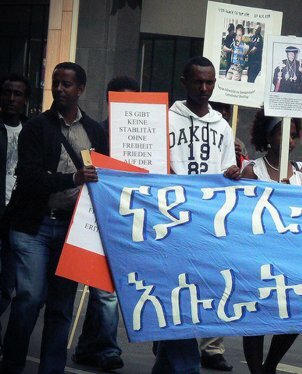 � 21.07.2008 - Eritrea President wants "media war"
afrol News, 2 March - Eritrea, the most closed dictatorship in Africa, has censored all news about the popular unrest in North Africa and neighbouring Djibouti. Only the exiled opposition talks about revolution. 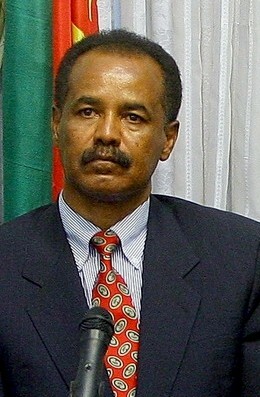 "Nowhere is the news blackout more extreme than in Eritrea, where the government has banned independent media since 2001," reports Mohamed Keita of the US-based Committee to Protect Journalists (CPJ), adding that the Ministry of Information blocks any news about the popular uprisings in North Africa and Djibouti. Eritrean sources told CPJ, however, that satellite dishes in the capital Asmara's rooftops allowed people to follow the unfolding events through media such as 'Al Jazeera'. But they do it at great risk, as the Eritrean government has agents all over the city, spying on citizens that could have dissident viewpoints. Following the Egyptian revolution, which could not be kept secret in Eritrea, event the Asmara Ministry of Information felt obliged to provide an analysis. In a large series, published through the Ministry's 'Shabait' website, one could read how the Egyptian revolution of - the one by Gamal Abdel Nasser in 1952 - had been betrayed over the years. Especially, the Eritrean Ministry held, "the US has been employing various ploys and conspiracies over the past half century to paralyse the Egyptian leadership." Faced by such a "neo-colonial" situation, the people of Egypt had rioted, to restore the Nasser revolution, Eritrean were informed. The analysis especially elaborates how Egyptian authorities had failed to go on the same road of development as Eritrea. Ex-President Hosni Mubarak had failed to maintain "ethnic harmony" and a "self-reliant economy," strongly contrasting Eritrea, according to the Ministry. In Asmara, the analysis probably had little credibility. Here, the word about the popular revolutions in Egypt and Libya has spread, while in the Afar east of Eritrea, news of the uprising in neighbouring Djibouti - also dominated by the Afar people - is an issue of wide discussion. ts are in jail, a great part of the ruling PFDJ party's officials and; religious minorities have had the same destiny. Not even foreign nationals are spared. In such a climate, it is difficult to take the first step of protest. But the large Eritrean Diaspora meanwhile has started dreaming of an Eritrean mass protest and revolution. Discussions and analyses about how a riot could be sparked are appearing by the dozens in the internet. One has to get the message through to the "passionate, enraged people in Asmara," holds Michael Abraha Thu, outlining a "Road map for the Eritrean Revolution." Yosief Ghebrehiwet meanwhile schematically outlines the "lessons from the Egyptian uprising," analysing the different factors needed to create an Egypt-like revolt. These discussions by intellectual dissident Eritreans are getting too abstract for many compatriots. Some are already taking to the streets, making use of their democratic rights in their new host countries. The Swedish capital this weekend saw a "huge rally, where about more 300 Eritreans and other democracy activists participated, ... calling the youth to lead the popular uprising against the dictatorship in Eritrea." The many armed Eritrean rebel groups, mostly based in Ethiopia, have also heard the news about popular uprisings elsewhere. The exiled, armed Red Sea Afar Democratic Organisation told the 'Sudan Tribune' they urged Eritreans back home to start the unrest. Then, they would start an armed insurgency to assist the protesters. "The only option left to topple the authoritarian regime is by force, and we want to see an Egypt and Libya type uprising in Eritrea," rebel Ibrahim Haron told the Sudanese newspaper, adding, "We call upon the armed forces of the country to join the uprising." But the calls seem premature. Every report from Eritrea indicates the country is totally calm; almost like a cemetery peace. Dictator Afewerki meanwhile is busy opening damns, roads, exhibitions and seminars and receiving the odd diplomat, if one is to believe the Eritrean Ministry of Information.